“Sea-urchin cactus, hedgehog cactus”, referring to the globular shape of the genus, covered with stout spines. A genus of globose to shortly columnar plants, flattened at the apex, solitary or densely branched. Stems with numerous ribs (up to 60), apex densely covered with wool. Large areoles, usually elongated, confluent in adult plants, having no nectar glands. Spines very stout, centrals well differentiated from the radials. Flowers diurnal, self-sterile, appearing in the wool, shortly funnel-shaped to bell-shaped, with scales ending into spines, yellow or pink, pollinated mostly by hymenoptera, reported to be sometimes pollinated by bats (￡. horizontholonius in Alvarez & Gonzalez, 1970, Gardner 1977, by Glossophaga longirostris in Dobat, K. & T. Peikert-Holle, 1985). Fruits globose to elongated, fleshy or dry when ripe, dehiscent or indehiscent, densely covered with scales and withwool. Seeds usually very large, black and papillose (E. polycephalus). 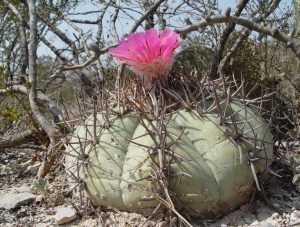 Considering the biodiversity of the species within the genus, Echinocactus grows in extremely diverse habitats, among bushes and grasses, on rocky, coarse sandy, rather mineral, sometimes limestone, but also slightly loamy soils, on rocky slopes, plateaus, in plains or mountains, in deserts (Sonora and Chihuahua) on gentle slopes, on conglomerates of quartz sand, on very arid, gravelly or rocky, sometimes clayey soils, in desert valleys, on hills, on edge of canyons, or in juniper and pine woodlands, from 30 m up to approximately 2200 m in altitude. Mexico (Chihuahua, Coahuila, Guanajuato, Hidalgo, Mexico D.F., Nuevo Leon, Puebla, Queretaro, San Luis Potosi, Sonora, Tamaulipas, Zacatecas), USA (Arizona, California, New Mexico, Nevada, Oklahoma, Texas, Utah). No Echinocactus grusonii? Why not? That is a cactus cultivation success story! Nearly extinct in the wild, it is so widely cultivated that one can buy it at anyplace that sells cacti. Echinocactus texensis is my favorite of the genus, for ease of cultivation, and mostly for its notorious reputation as the Horse Crippler.